I won’t lie. When I received my March 2015 Cuisine Cube in the mail and, as I always do, tore into it to see what goodies awaited me, the product I was actually the least excited for were the crackers. Why? I dunno. I think they just looked too much like the Mary’s Gone Crackers and Crunchmaster Crackers that I’m already familiar with. So, yeah, I sort of tossed these up on the shelf of my pantry and left them there for most of the month. I should have known that Cuisine Cube wouldn’t steer me wrong. As you all are aware by now, Cuisine Cube is a subscription service that delivers a box of gluten-free products from lesser-known companies and artisans – from each course of the day. There is a product included for breakfast, lunch, dinner, dessert and snack. Sometimes…a bonus product too. Love those little bonuses. And you get this cube of goodness delivered to your door starting at $29.99. I signed up for it almost a year ago and haven’t been disappointed yet. So, I should have known better than to doubt their gluten-free snack wisdom. 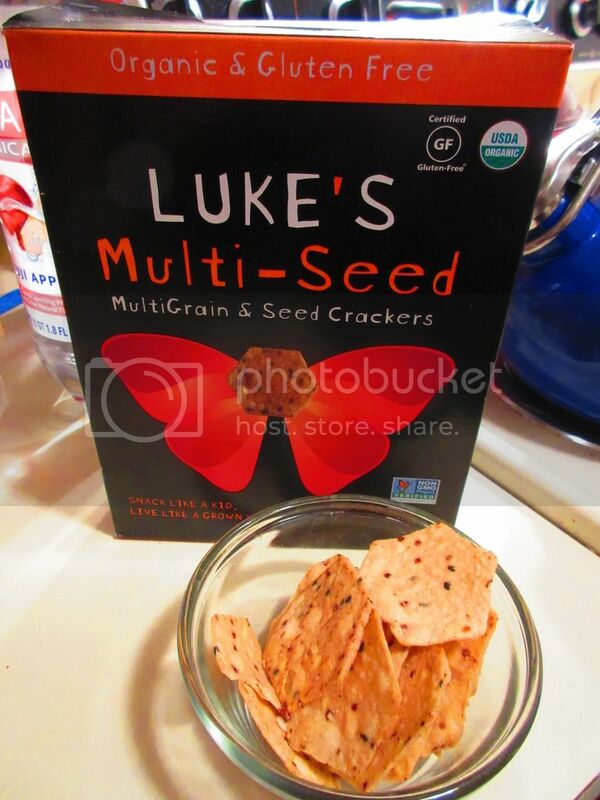 In the March 2015 cube, I received a box of Luke’s Multi-Seed Multigrain & Seed Crackers. From the picture on the box, of a polygon shaped cracker with butterfly wings, I immediately likened it to the predecessors I have consumed before – as I mentioned – Mary’s Gone Crackers and Crunchmaster (especially Crunchmaster). Not impressed, I delegated it to the top shelf of my pantry, until the evening I cooked up the Lentilicious meal (previously reviewed) and my roommate said it would be nice to eat it with some crackers. So, let’s first talk a little about Luke’s Organic, shall we? Luke’s Organic was created by Luke (who else?) who was diagnosed with Celiac Disease when he was 7 years old. Ever since then, he has been on the lookout for great tasting, gluten-free snacks. Of course, for the longest time, such snacks didn’t exist. Everything tasted like cardboard or tree bark. But not anymore. And adding to the growing array of snack choices is Luke’s Organic. Snack crackers barely catch my eye anymore. I’ve pretty much been there and done that and just sort of…like them. Nothing has really blown me away. So, I was actually quite surprised to open up this box of Luke’s Multi-Seed Multigrain & Seed Crackers and discover something very unlike Mary’s Gone Crackers and Crunchmaster. Perhaps not in looks, save that Luke’s crackers look more corn chip than the darker appearance of the previously mentioned brands. So, there was that. But appearances aren’t everything. And when I popped one into my mouth to make sure it would be worth packing as a side to my delicious Lentilicious…I was even more amazed. HOLY GLUTEN FREE CRACKER, BATMAN! Or something. Forget cracker. These taste more like an amazing tortilla chip. Like…restaurant quality. Like…why don’t the tortilla chips I buy at the store taste as good as the ones I’m stuffing my face with here at this restaurant…good. See what I’m getting at here? These crackers are so different from anything else I have had since having to go gluten-free three years ago. It’s a cracker…and a chip…and a nutritious snack as well. And, for a sidelined active girl like me…that’s just what the doctor ordered (well…that and an MRI, but that’s for another blog). Seriously, these will take away any salty craving without braking the calorie bank. And they are made with whole grains, they are organic, and are non-GMO. WINNING! There is absolutely no corn in these…but that’s how they taste. The magic of the culinary world. Just WOW! So, now that I’ve kind of already lead into all the good stuff that goes into Luke’s Multi-Seed Multigran & Seed Crackers, let’s talk about the happy ingredients that make these up, shall we? Luke’s Multi-Seed Multigrain & Seed Crackers are made from Luke’s Organic Grain & Seed Blend (brown rice flour, millet flour, quinoa flour, amaranth flour), organic potato starch, Luke’s Organic Oil Blend (sunflower safflower and/or red palm olein), organic sesame seeds, sea salt, and organic red quinoa seeds. These crackers are made in California, are organic, are gluten-free, soy-free, dairy-free, peanut/tree nut-free, whole grain, non-GMO, and kosher. They are also cholesterol free and contain no sugar. WOOT! As for nutrition, the facts are as follows…Luke’s Multi-Seed Multigrain & Seed Crackers contains about 3.5 servings per box, with a serving being 1 ounce (or 28 grams…or around 12 crackers). This serving will dish up 140 calories and 5 grams of fat. This serving also will give you 150 mg potassium, 85 mg sodium, 18 grams carbohydrates, 3 grams of fiber, and 3 grams of protein. The lack of sugar is great for someone like me who is trying to cut down on sugar (and not really succeeding…as of yet). You know, appearances really are deceiving. And this just goes to show you can’t judge a product by it’s box. I was beyond impressed with the crunchy texture, the amazing taste, the light hit of salt, and…well…everything that this snack cracker had to offer. Forget anything that you normally reach for…try something new and exciting. Find Luke’s Organic or order online. I would never steer you wrong…and these…these are worth every moment of the hunt for them. May the grocery store shelves be ever in your favor…and may they have your favorite flavor! Thank you to Cuisine Cube for surprising me with this product and showing me that something that looks like your typical cracker is anything but that. Luke’s…you’re awesome. I shall be enjoying you again soon! This entry was posted in Crackers, Cuisine Cube, Food, Gluten-Free, Products, Quinoa, Review, Snacks, Vegan, Vegetarian by The Celiathlete. Bookmark the permalink. are these baked or fried (like their chips)?